If you like tea and jam, then you probably know about scones. But, if flowery cups and saucers and sweet things are not your cup of tea (sorry) then maybe you're not a fan of them. Scones are a dense, sturdy type of biscuit that make me think of British ladies in funny hats at tea time. Actually, despite their association in my mind, I find scones very versatile and easier to adapt to different meals than say a muffin. There are many different types of scones, depending on where you live. (here's a brief history). The scones we often see in stores in the States are overly sweet. This recipe is a savory version with no sugar at all and works well not just at breakfast, but anytime a cheese infused baked good would be nice. And really, when isn't there such a time? 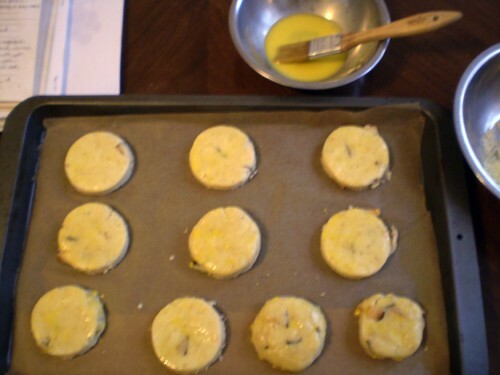 These savory scones were inspired by an old post by Clotilde of Chocolate & Zucchini. It was one of the first scone recipes I ever tried and it was a huge hit. It incorporates Clotilde's suggestions for how to make your own dried pears, which are easier than you'd imagine. Core a pear and place on a baking rack for 4 hours in a low temperature oven (175 deg F), flipping them half-way through. Just remember to dry them the night before you want to make the scones, and to avoid snacking on them, leaving you none left for baking. I have done it, and if you fall victim yourself, dried apricots finely chopped are a good substitute. I changed the type of cheese from the original recipe and tweaked the measurements a bit for what worked for me. I like using Gruyere cheese because it makes me think of France and French food, which in turn makes me think of Clotilde, who was one of my first introductions into the world of food blogging. I watched her blog grow with a mixture of admiration and jealousy. She made it all sound so lovely, living in Paris and discovering the joys of cooking. She was often my escape as I sat at my desk pretending to do work, reading about what I wanted to cook later that day. Her life seemed like a dream to me, filled with good smells and always something new and delicious to discover. I am glad that food blogging didn't disappear like a passing fad, but entrenched itself into our food culture, where we read and learn about cooking, and find inspiration and community. Food blogs have changed a lot since I started reading them, but the old posts are like old memories. It still thrills me to see my comment on her post from 2006 and remember how elated I was the first time I made this recipe. That's why I had to share it. I have made these scones for tea parties, weekend brunches, and at times just for my own enjoyment. I generally eat them not in a dainty fashion, but standing over the kitchen counter slathering jam on them warm from the oven. That's really the key point to remember. You should think of these as the embodiment of what's great about home cooking. Your scones can be anything you want them to be, sweet or savory, plain or jazzed up. You do not need a special occasion more than a meal at home as your excuse to make these. Baking scones is all about doing something that makes you happy in your daily life, whenever you can make time, even if it's cheesy. 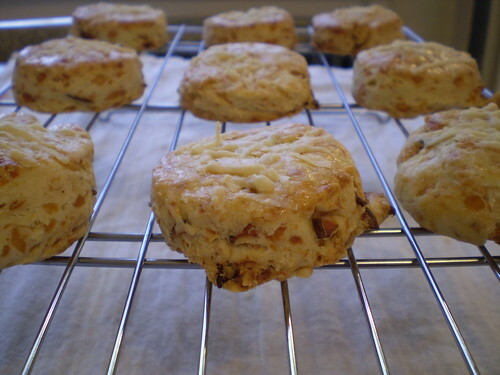 Cheesy Scones with Dried Pears Adapted from Chocolate & Zucchini. Feel free to substitute your favorite types of hard cheese and dried fruit in this recipe. Preheat the oven to 350 degrees Fahrenheit. Line a baking sheet with parchment paper or a silpat. Whisk flour through salt in a large bowl until combined. Add butter and rub into dry ingredients until mixture resembles course crumbs. I do this with my hands, working quickly. Add cheese and pears and mix in with a fork. Add cream and mix gently until dough starts to come together. Add more cream if needed. Turn dough out onto floured surface, giving it a gentle knead if it's not completely holding together. Roll out till it's a circle about 3/4 inch thick. If it's flatter that's ok, just means you'll have flatter scones. They're still tasty. 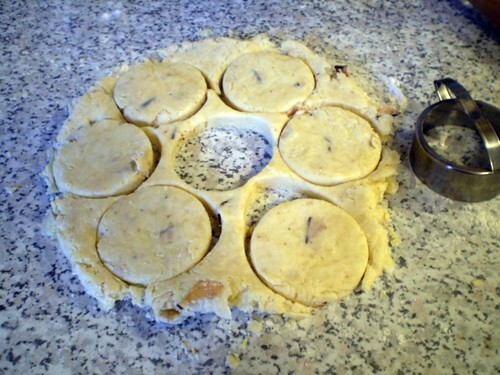 Place scones on baking sheet and brush top with egg mixture. Bake for 20-25 minutes, until puffy and golden. I like to rotate the baking sheet half-way through for even baking. Feel free to add a sprinkling of extra grated cheese on top 10 minutes before they're done.